A1 PQG (Prime Quality Graphics) Pumpkin Pie Full Color Strap merchandising labels are designed to make YOUR store-made/ store packaged product look, in the package, as good as it tastes. 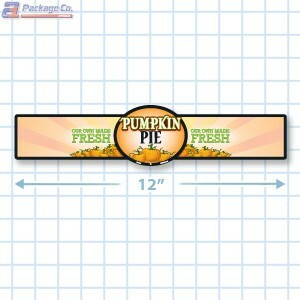 The Pumpkin Pie Full Color Strap merchandising labels can be ordered and used as a stand-item, or as part of a branding campaign for your store. This merchandising label is part of the Bakery Labels Collection, see what other Pie Labels we have to offer here. The A1 Team appreciate the opportunity to present you with our A1 PQG Pumpkin Pie Full Color Strap, 11.75 x 2.625", pressure sensitive labels and Thank You for considering or purchasing our products. Copyright © 2015 A1 Package Co.